The Cool Hand Luke Mailing List. Sign up for my mailing list and be kept in the loop regarding upcoming shows, new mixes, new songs, etc. This is a low volume mailing list with mailings between once a month and once a week. Just type your name and email address and answer a simple math problem in the boxes below, click the button and you're on the road to eternal bliss through mailing list subscription. 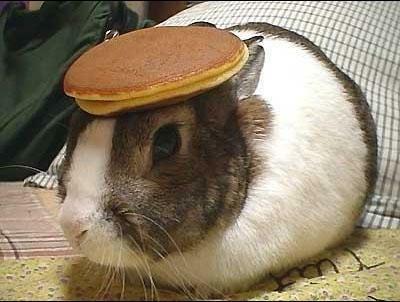 For no reason at all, here is a picture of a bunny with a pancake on it's head.